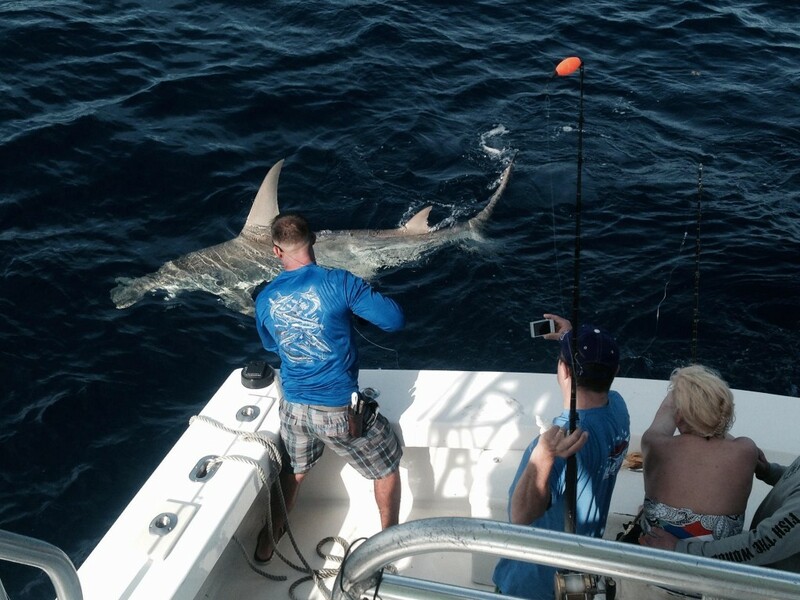 Giant Hammerhead Shark Caught- Shark Fishing Season is Here! Today we caught a monster hammerhead shark, fishing in 350ft of water off the coast of Fort Lauderdale. The Out of the Blue, with Capt. Rod at the helm, led the expedition with some folks that wanted to “catch something big!” With that in mind, we went out to our shark fishing grounds, about a mile and a half off the coast of Fort Lauderdale beach which is about 350ft deep of water. Bobby, first mate aboard the boat, set the lines including a shark bait on the bottom, a shark bait positioned mid-depth held in place with a balloon, and a couple of baits fished out of our fishing kites (live goggle eyes). We sat there for about 40 minutes with no action before we got the bite. The shark hit the bottom bait, our 130 Penn International we had set in the covering board. On the bite, the rod doubled over and the rod tip nearly touched the water. Bobby screamed on the bite, “There he is!! Go Cap’, Go!!!!”. Rod pulled ahead with the boat hard to set the hook and we got the angler strapped into the fighting chair to fight the fish. 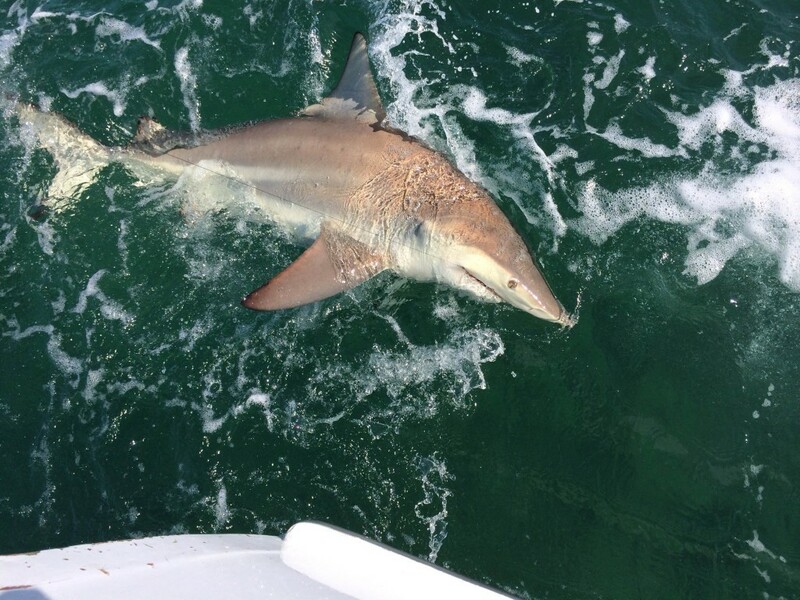 Our angler’s name was Diana January, a gal from Texas, who was going to catch this shark no matter what. We fought the shark, without seeing him, for almost 2 hours. Finally, the angler and the shark equally exhausted, we landed the fish. We got the fish measured and photographed, and ultimately cut the leader on the fish so he could swim away. We are now fully into the famous shark fishing months off the south Florida coast. Every year, hundreds of thousands of these APEX predators, swim offshore of our coastline, migrating for food and mating purposes. They use the Gulfstream current as a sort of “conveyor belt” to maximize their migration efforts and keep them in prime areas for hunting. We have, over the next few months, some of the best, world-class shark fishing there is to be had on this planet. If you’re into fishing for and fighting one of the largest and most sought after predators in the sea, book your shark fishing charter with us now. February through May tend to be the peak months. Some years, shark season extends all the way into June and July, but you never know. 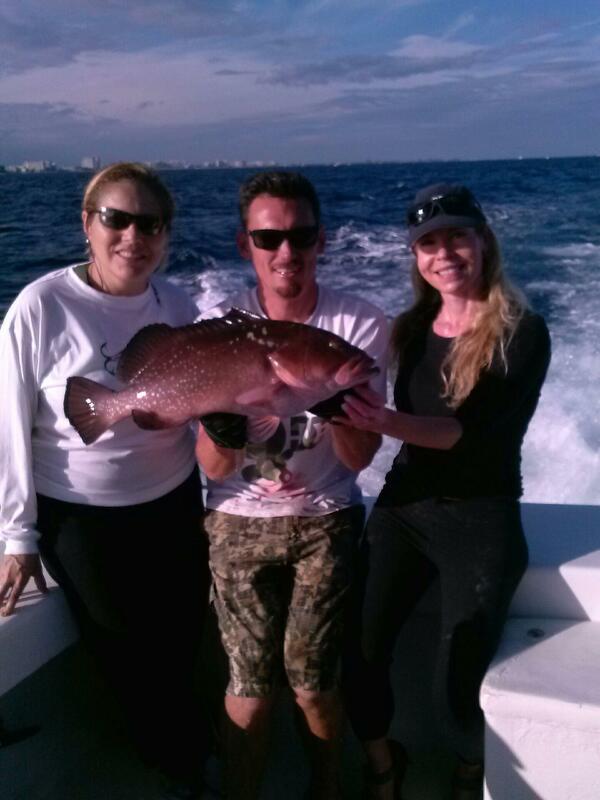 Thanks for fishing with us Diana, I’m glad you caught yourself a monster! Good luck to everyone fishing this next week. 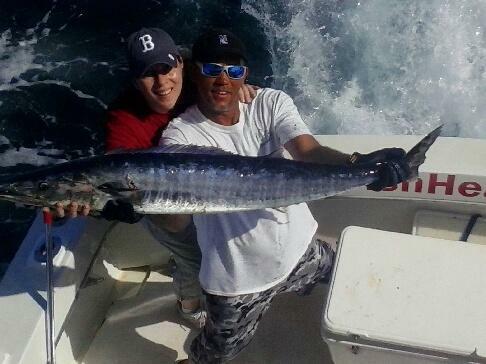 The wahoo and sailfish bite is on fire off the coast of Fort Lauderdale this week. Wahoos are biting right on the reef in as shallow as 80 feet of water. 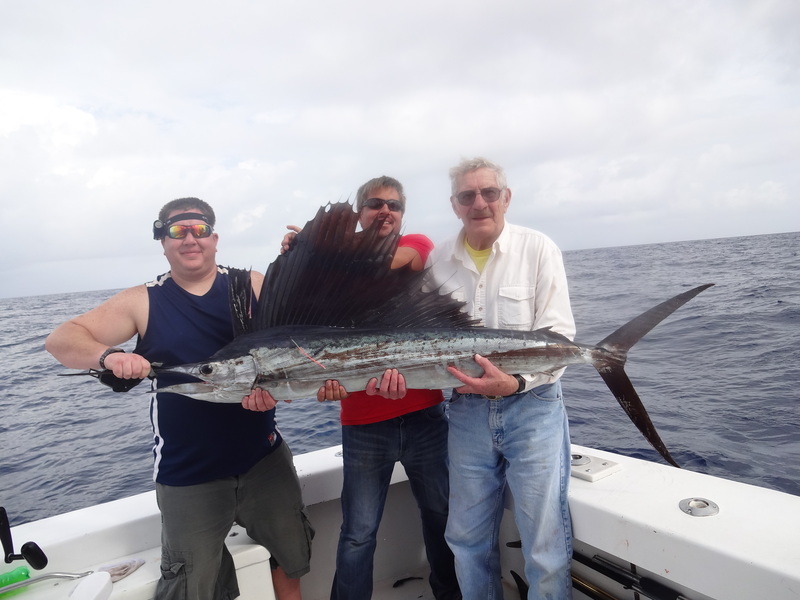 Sailfish too are making a strong surge in their numbers, with our boats averaging 2-3 per day. This is to be expected in February. As the fronts move through and the barometer drops, the fishing action heats up. Wahoo are biting best on the troll and are slamming the deep baits. Wire leaders are a must as those razor sharp teeth will cut through anything not made of steel. We’re also catching a few wahoo live baiting, either out of the kites or slow trolling live baits from of the outriggers. 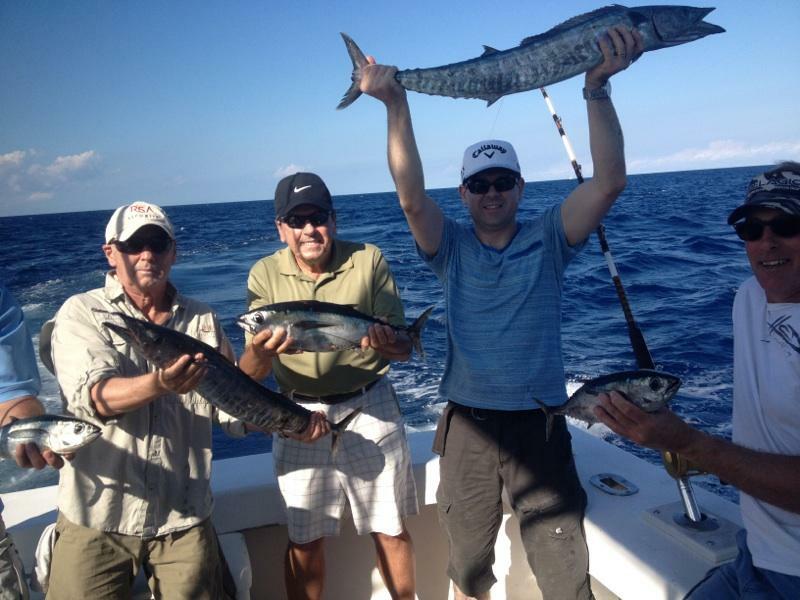 The numbers of wahoo we’re catching on our sportfishing charters this year is extraordinary. Sailfish action remains strong through the depths of 90-150ft of water, also known as “Sailfish Alley”. Kite fishing is the most effective method to catch sailfish and they are eating goggle eyes, pilchards and mullet baits the best. Trolling can also be effective for sailfish, as you cover much more water when trolling, but kite fishing is still the best. The cooler weather coming this week should get them even more stirred up. February is traditionally the last really good month on sailfish here in Fort Lauderdale and it looks like February is going to finish off an already great season with a bang. Tunas, kingfish and mahi-mahi are also patrolling the reef and add a little variety to our catches these days. Look forward to some awesome mahi-mahi fishing towards the end of the month and into March. Last year was outstanding mahi-mahi fishing as the mahi-mahi came into 100-300ft of water during any easterly wind. Tunas are mostly small, but they school up and we catch a lot of them when we find a school. Sometimes bigger tunas are mixed in with the small tunas and will make a fatal mistake of taking our baits. They all taste good! Wreck fishing for amberjacks is also starting to get good. During the spring months, the amberjacks school up in the wrecks so thick that you can hardly get a bait down to the bottom. They are already starting to make their presence known and are getting more and more aggressive when fishing around our local wrecks. Groupers, out of season now, are also biting good. Fun to catch and it hurt to have to throw back such a tasty fish. I’ve been seeing more and more groupers since the grouper season took effect so the regulations they are making are working. We’re stocking up for the rest of the year, so book your grouper charters now (anytime after May 1). Shark fishing season is also getting underway. February is the start of our shark fishing season where thousands upon thousands of hammerhead sharks make their migration down our coastline. 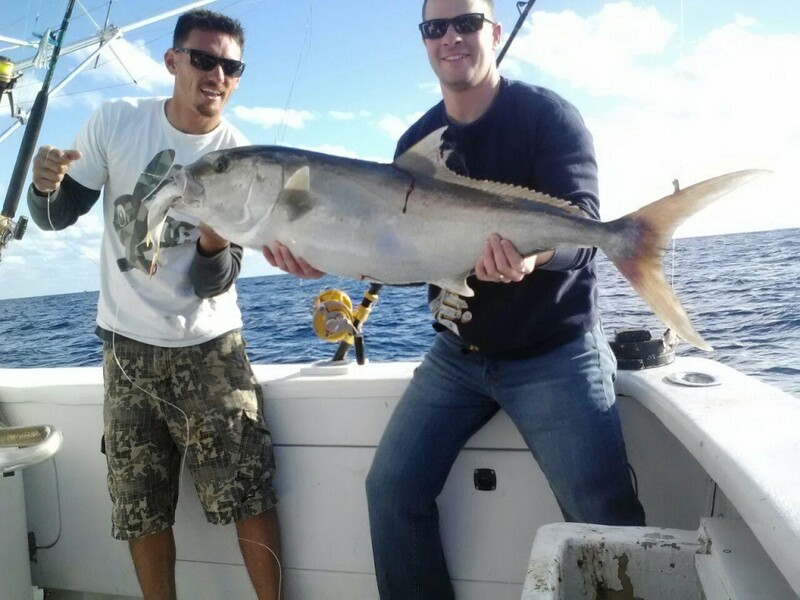 This is our Big Game fishing season here in Fort Lauderdale and we’re beginning to catch our first few of the year now. Shark season lasts well into June and sometimes through as late as August. March through May are the peak months. Good luck to everyone fishing out there over the next couple weeks. You have plenty of fish to keep yourself busy with reeling in!